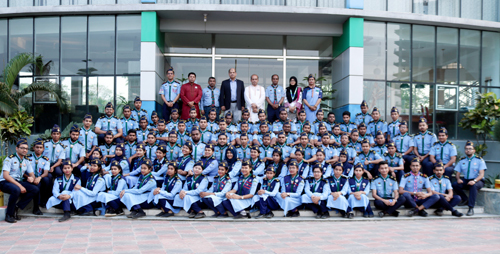 Mr. Zahirul Haque, National Coordinator of Bangladesh Scout and Joint Secretary, Ministry of Liberation War Affairs, Professor Dr. Yousuf M Islam, Vice Chancellor, Daffodil International University and Mr. Hemayet Hossain, Leader Trainer of Bangladesh Scout along with distinguished guests and Members of DIU Air Rover Scout Group pose for a photograph at Independent Camp 2019 held at permanent campus of the university at Ashulia, Savar. To mark the 48th Independence & National Day of Bangladesh, DIU Air Rover Scout Group organizes Independence Day Camp-2019 on March 29 (Friday) at Permanent Campus of Daffodil International University (DIU) at Dattapara, Ashulia, Savar, Dhaka for the first time in Bangladsh. Mr. Zahirul Haque, National Coordinator of Bangladesh Scout and Joint Secretary, Ministry of Liberation War Affairs was present in the program as the chief guest while Mr. Hemayet Hossain, Leader Trainer of Bangladesh Scout and Zonal Executive Officer, Zone -3 of Dhaka North City Corporation was present as the special guest. Professor Dr. Yousuf M Islam, Vice Chancellor, Daffodil International University presided over the program. The program was also addressed by Mr. Md. Anowar Habib Kazal, Treasurer, DIU Air Rover Scout Group, Girls in Rover Unit Leader Farhana Rahman Setu, PRS and RSL Shaiful Islam Khan, DIU Air Rover Scout Group. A total of 140 Rovers and Girls in Rover including 4 Rover Scout Leaders participated in this Camp. Senior Rover Mate Jui Roy and Nazmul Hassan provided overall assistant to organize the camp. The daylong camp included Training, Workshop, Awareness session on our Liberation War, hi king and discussion session. 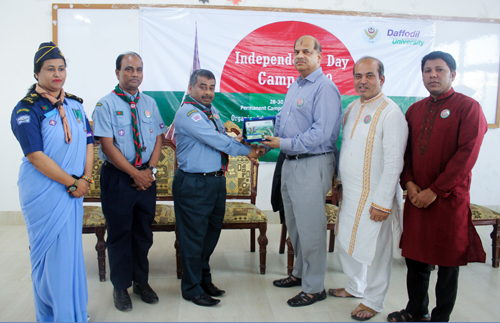 Addressing as the chief guest National Coordinator of Bangladesh Scout Mr. Zahirul Haque said, this is for the first time in Bangladesh that DIU Air Rover Scout group has taken the initiative to hold Independence Day camp to commemorate the history of our Liberation War. He urged the rover to come forward to know the details of our liberation war as well as the contribution of our great leader Bangabondhu Sheikh Mujibur Rahman in Liberation War. He advised the rovers to maintain and follow the rules and ideas of Baden Powell to mould a moral character and to create a beautiful Bangladesh-the dreaming Sonar Bangla of Father of the Nation. He appreciated the recent activities done by the Rovers of Daffodil International University and suggested to keep up the speed.